I used to be a milk choc girl, but after deciding to give up shop bought chocolate, with its sugar, colouring, flavouring and additives, I created dark chocolate orange sweets to help me through that time. In August 2014 I made a pledge not to buy (or eat!) shop bought chocolate for a year. By the time the pledge was fulfilled, my craving had disappeared. I have bought shop chocs 3 times since (on weak days, when I wanted to double test my tastebuds and see if I still enjoyed them) and I can honestly say the desire really has gone. Some of my old faves now taste like plastic or simply too sickly sweet. Are you ready to challenge yourself to move across from additive filled treats to homemade yummies? 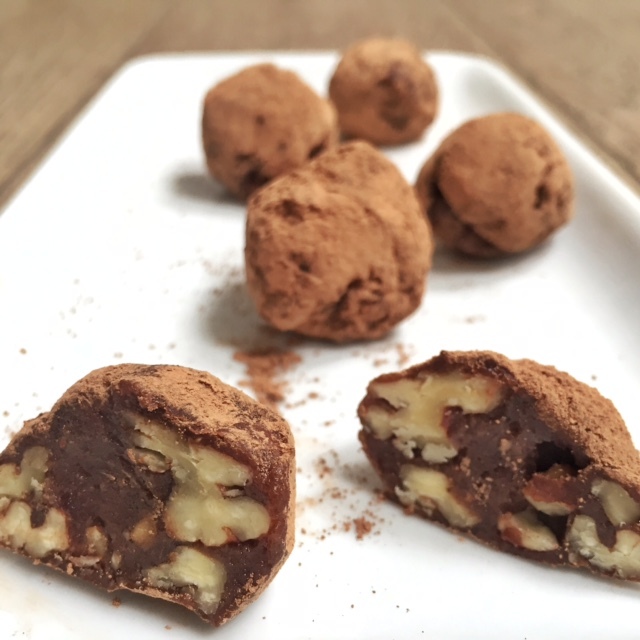 Since that time I’ve been busy creating other styles of chocolate treats with less sugar (dates) and will be sharing some of those with you in the book I’m writing with my naturopath, which we aim to have ready for release next year. So .. today’s recipe is a little decadent. I’ve not included alcohol in a recipe here before because these days, I prefer my food to be alcohol-free and eat everything I make for you. (That’s the fun part!). However, there are times when I know we all have days off. You may be entertaining friends with a lovely meal, serve coffee and like to serve them a rich, small tasty to complement the beans. However, we all take days off. You may be entertaining friends with a lovely meal, serve coffee and like to serve them a rich, small ‘tasty’ to complement the wind down to a fun evening. With this in mind, I’ve married pecans and chocolate with an orange liqueur. Naturally, you could replace the alcohol with blended fruit if you prefer. I haven’t tried this yet, but will do this next time I make a batch. Place all your ingredients in a high-speed blender or food processor. If you’re using a blender, take your tamper and, once the machine has been switched on and is running at medium speed, remove the lid and use your tamper to help crush the nuts and blend the mixture to a fudge-like consistency. Use a long, metal palate knife (plastic ones will get damaged by the sharp blades) to remove all the fudge. It’s sticky, so will take a little time. Roll the mixture into bite sized balls and coat them in raw cacao, to prevent them sticking together when you freeze them .. and to remove their general stickiness to the fingers when handling. Freeze immediately. They will last for months in the freezer. You can eat once they’ve had a few minutes to defrost a little, depending on how firm you like them. Next week I’ll post a tutorial video I filmed on Facebook, making these sweets. Not joined me yet on Facebook? Search ‘Fermented Foody’ … LIKE my page, click the downward facing arrow next to the LIKE button and choose SEE FIRST. That way you’ll receive notifications when I go ‘live’ on air and can chat with me in real-time by texting onto the screen. I answer as many questions as possible and follow up after broadcasts. We have a lot of fun!